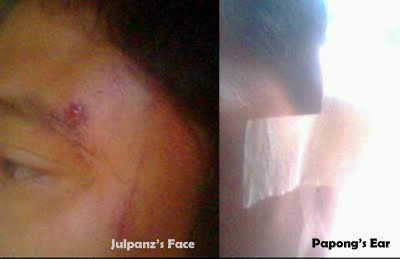 On July 18, 2009; Julpanz and Papong got hit in their respective faces by an unidentified robber at Tibolo while attending wedding ceremony of a close friend. 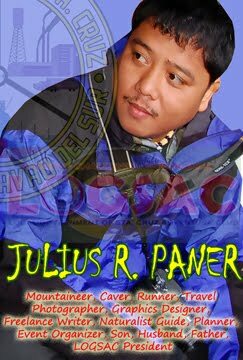 Julpanz obtained bruises at the left portion of his head and face while Papong endured the split of his left ear which gained him 9 stitches. 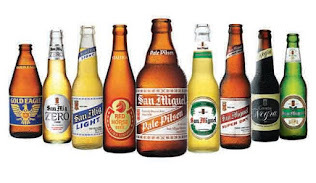 The suspect was said to be under the influence of liquor during the incidence who went straight to the house where the victims slept. It happened at about 3:30 in the morning. For now, Papong is back to his usual funny self while Julpanz, according to the x-ray result, gained negative consequences in the internal and external head parts. One note of caution: Beware of bad people around, you might felt complacent about them knowing they’re good as you think, but they also thought the other way around. To endure in the midst of crisis, bad people are ready to kill just to earn a living. So sad, indeed.